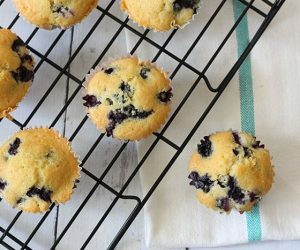 This recipe for blueberry muffins is super easy to whip up. 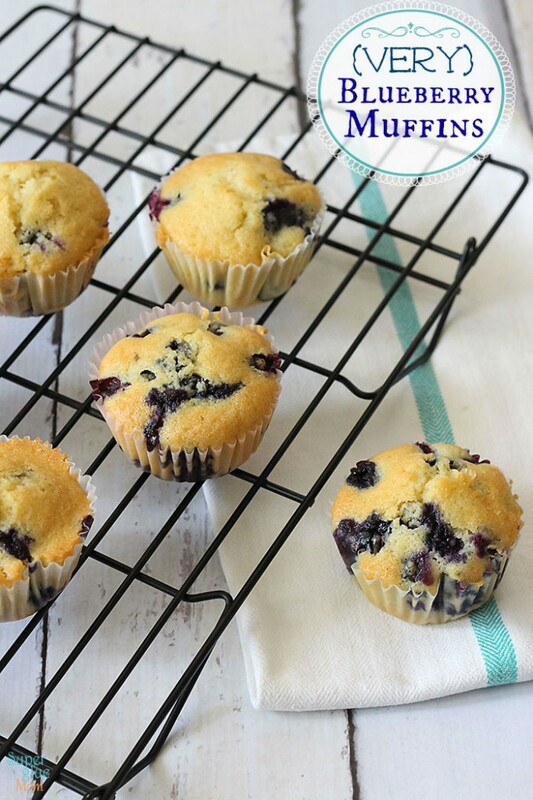 It’s one of those one bowl wonder recipes where the outcome -the best blueberry muffins you’ll eat- will be a family favorite. Of course, I might be a little biased. I can’t remember where I got the original recipe, but it called for a whole cup of butter! Um, yeah, no. Yes, butter makes things better, but certainly I didn’t want a whole cup in 9 muffins. I admit that I baked the original recipe and they were sinfully delicious –“sinfully” being the key word. So off I went into my kitchen to achieve the same soft and buttery muffin texture but without all the butter. I have to tell you that my family wasn’t too opposed to my recipe testing, and the summer was the perfect time to do it since blueberries were abundant and inexpensive. Plus, as you can see from this quick video, it’s an easy recipe to make and nobody complained when I made a lot of muffins, many days in a row! They also freeze great, by the way. When exactly does someone like me fit in recipe testing? I usually test recipes late at night or early Saturday mornings. Actually, most breakfast and baked recipes are tested over the weekends when the kids are home and naturally play around the kitchen. Photos always happen shortly after I take things out of the oven. I think the whole “the house smells amazing” thing helps get everyone in the mood to try whatever mom is baking. Is there such a thing as not wanting to try my baked goods? Oh, yes there is! I have very picky eaters who will refuse to try stuff -with the exception of anything chocolate. Baby G, of course, is always ready to try any recipe. He is usually waiting impatiently a foot away ready for mom to walk off to grab something so that he can make his move. Like in this post, where I stepped away from the food for thirty seconds to help his brother and I came back to him chowing down on the spaghetti bolognese. I also simplified the recipe so that you can mix all the ingredients in a single bowl when making the batter. If you are a prep-at-night kind of person, you’ll love that you can also make your batter, scoop it into the muffin cups and refrigerate overnight. If you have leftover blueberries, you might want to whip up a batch of my favorite gluten free blueberry scones. They are utterly delicious. I hope your family enjoys these blueberry muffins as much as mine. Oh, and you might want to double the recipe… I’m just saying. 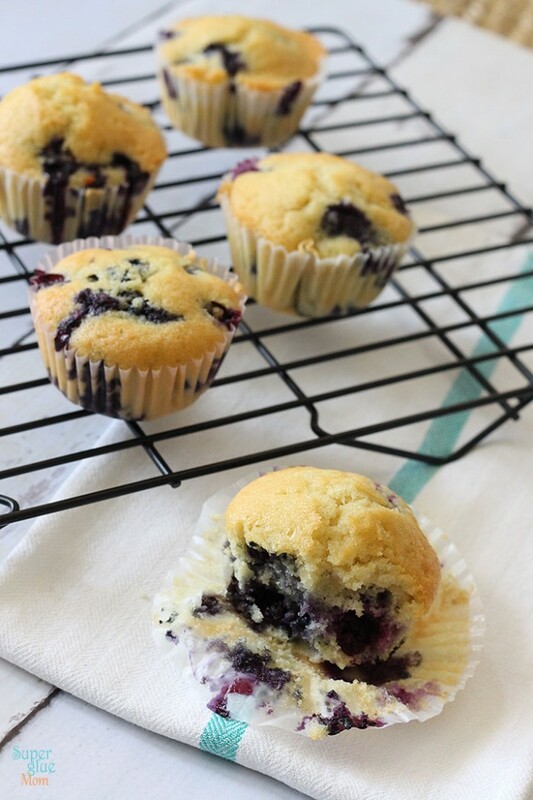 Delicious recipe for homemade blueberry muffins. These have LOT of Blueberry flavor and less butter than usual. YUM! 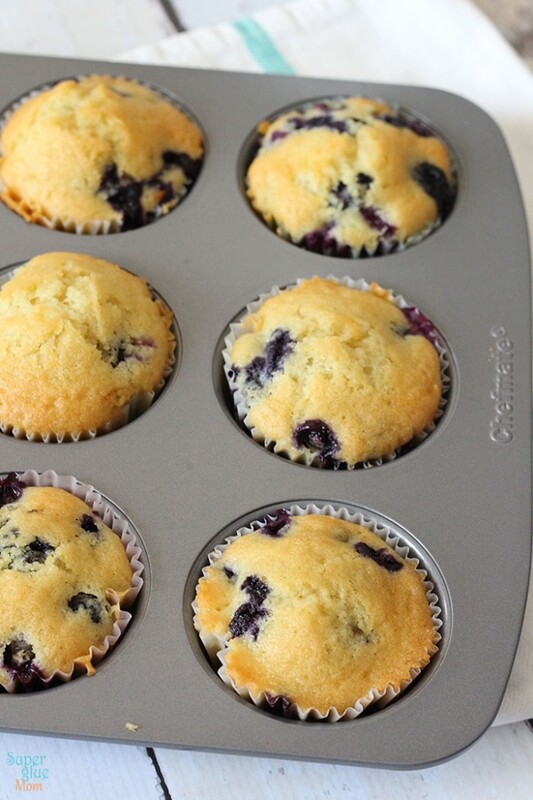 Preheat your oven to 375F and line a standard muffin pan with 9 paper liners. In the bowl of your stand mixer, cream butter and sugar. Add egg, then vanilla and milk. Once your wet ingredients are throughly combined, sift in your all purpose flour, baking powder, and salt. Carefully fold in 1 cup of fresh or frozen blueberries with a rubber spatula. Spoon muffin batter evenly into 9 muffin cups. Bake for about 22 minutes until tops are golden, toothpick comes out clean and they are bouncy to touch. 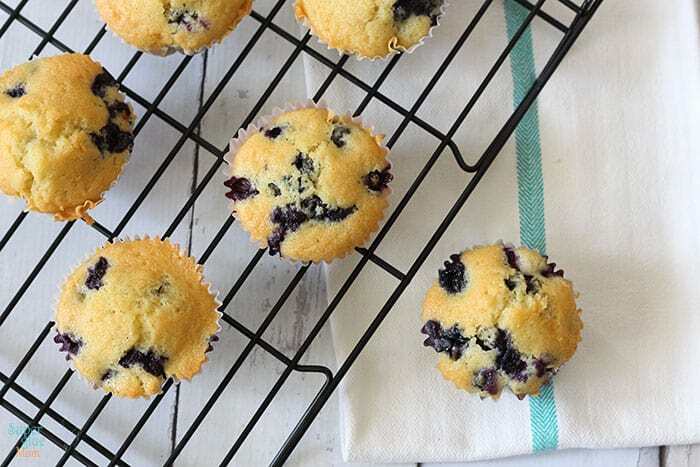 Make muffin batter ahead of time, scoop into muffin tins and refrigerate overnight. In the morning, remove from fridge while oven is preheating. UPDATE: these will be very dense if you make them 100% standard whole wheat. they still come out ok with soft white wheat (pastry whole wheat flour) and 1/2 all purpose white and 1/2 whole wheat. Do they need to be refrigerated overnight? I store leftovers in the refrigerator. Absolutely, almond milk works great in this recipe as well. SO good! My kids love them, and I love that they’re not full of a STICK of butter like many recipes.Easy & tasty! Thanks! Delicious! I froze these after baking to have on hand throughout the week, and they reheated beautifully!